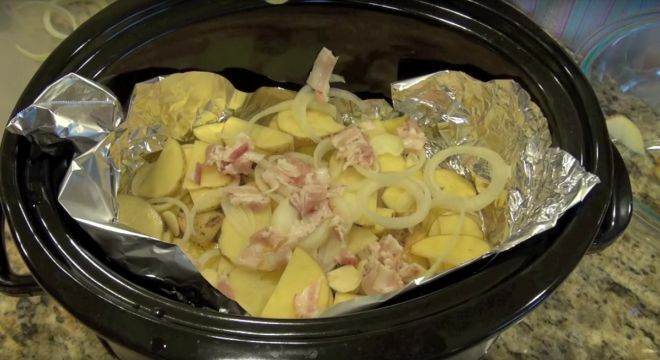 To begin, line your slow cooker with tin foil to keep your ingredients from sticking to the dish (and creating a cleanup nightmare). Alternatively, spray your slow cooker insert with non-stick spray. Slice potatoes in half and then slice them into quarter-inch pieces. Slice your onions into 1/4 inch rings. Lay a thin layer of potatoes on the bottom of the slow cooker. Add a few slices of garlic on top of your potatoes followed by a layer of onions and a a bit of salt and pepper. Continue layering your potatoes, garlic and onions until your main ingredients are all in the slow cooker. Next, top the potatoes and onions with your bacon pieces. You can add the bacon into the slow cooker raw, or crisp it up beforehand. It works either way. Top the entire dish off with one cup of cheese (the other cup will be added at the end) and add a few tablespoons of butter on top of your cheese. Cover the entire dish with a layer of foil. 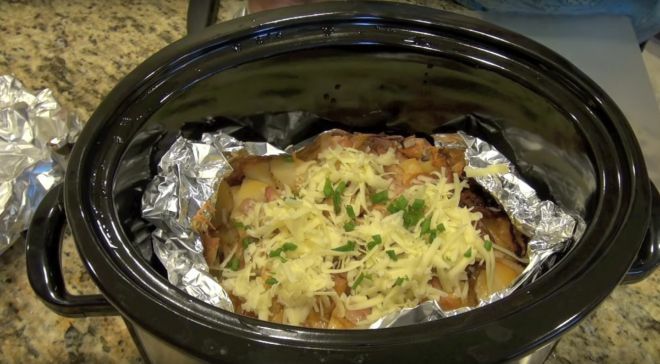 The foil will keep steam close to the potatoes so they cook faster. Cover the slow cooker with the lid and let your dish cook on high for 6 hours or low for 8 to 10 hours. After removing the foil, and checking to make sure the potatoes are cooked, add a cup of cheese on top of your dish and finish it off with slices of green onions. This combination of cheese, potatoes and bacon will have your family and friends scrambling for seconds.